I often get asked what essential ingredients I always have on hand to make Greek dishes that give the most delicious results. It’s pretty much a given that using Greek products will help you achieve the best results. In Greek cookery we do not use many special ingredients other than for example Greek saffron, mastic, trahana and petimezi (grape must). There are many ingredients I have on hand to prepare my Greek dishes. Here are ten that should be in the kitchen of every cook who loves preparing delicious Greek food. Greek Olives and Olive Oil have been important since ancient times both in cooking and healing. To the Greeks, the olive tree is a symbol of knowledge, wisdom, abundance, peace, strength, beauty and health. Olive oil is not only good for your health but cooking with it adds a fantastic flavour to any dish. I prefer organic extra virgin olive oil and use it all my cooking including deep frying. 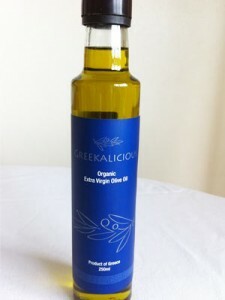 In Greek cookery we do not use any other types of oil. My favourite olives off course are Kalamata Olives where my mother comes from and I enjoy tossing them in salads, pies, dips or just enjoying them as a snack on their own. The ancient Greeks pioneered and advanced cheese-making techniques from the basic to the modern sophisticated methods of today and doesn’t it show. Cheeses in Greece are predominantly made from goat’s and sheep’s milk, which are generally healthier than cow’s milk. There are hundreds of cheeses in Greece and every island and region has its proud example. There are many Greek variety of cheeses that I have in my fridge and include, feta, kasseri, kefalotiri, kefalograviera and haloumi. I add them to my salads, pies, and various other dishes. Herbs in ancient Greece were used both as a food and as a source of healing. As a food they were a main staple along with fruit and vegetables. The herbs that were consumed in ancient times and still consumed today include rosemary, coriander, basil (considered the royal herb for the Greeks), oregano (rigani), mint, thyme and parsley. Herbs are a great way to add flavour to your dishes without the added calories. Filo pastry making is an ancient Greek tradition that continues today. I always have filo pastry on hand because it is an ideal way to transform left overs. When I have left over chicken I simply add some feta, fresh herbs, spices, sautéed mushrooms, seasoning and beaten eggs and wrap in some filo to make a scrumptious chicken pie. In ancient Greece lemons were used for culinary and non-culinary purposes. According to Greek mythology oranges and lemons were a symbol of richness and love. Lemons are a must in any Greek kitchen; they add the sour element to many dishes. They are one of the main ingredients in ladolemono (olive oil and lemon dressing), which is used as a marinade and a dressing. It’s squeezed on everything from potatoes to meats, on roasted and fried cheeses and adds a classic Greek taste to vegetables and fish. In ancient Greece salt was and still is an important addition to food to give it a salty element, as was fish sauce (garos). I enjoy using good quality Greek sea salt in my cooking. I also enjoy using the black sea salt from Cyprus. Enjoyed since ancient times thick, plain strained yogurt is a must in Greek cooking. It’s a great substitute for recipes that call for cream. It is a way that we add the sour element to our cooking. I use it in my dips, soups and stews. I love it on its own with crushed walnuts, Greek honey and pomegranate seeds. Since ancient Greece this has been the main Greek sweetener. Greece has a variety of plants and flowers and therefore produces a range of different honey flavours. In Rhodes there is wildflower and pine honey, in Psara and Crete thyme-infused honey is popular, and so on. Greek dishes use a lot of honey, mostly in delectable pastries, but also in other recipes. I use honey instead of sugar in most of my cooking. Vinegar since ancient times has been a form of adding the sour element to a dish. It is added to soups, salads and many other dishes. I always have red wine vinegar, apple cider vinegar and balsamic vinegar in my cupboard. My favourite balsamic vinegar is the fig infused one from Kalamata. You can find many Greekalicious recipes using these ingredients in my books: “My Greek Family Table”, “A Greekalicious Feast” and “Cooking and Eating Wisdom for Better Health”.